The historic Twist-Basler House in Santa Ana is finally being moved. The top photo shows what the original Broadway site now looks like, with one part of the house gone, and a second part ready to be moved after midnight tonight. 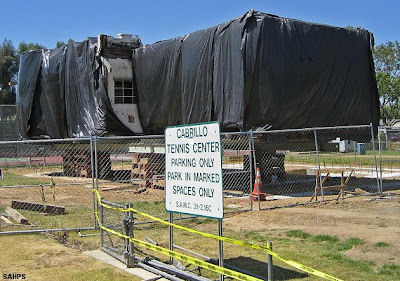 The lower photo shows the first section of the house in it's new home at the Cabrillo Park Tennis Center. If you happen to get photos of any part of the house actually being moved, please let me know – Both I and the Santa Ana Historic Preservation Society would like to post them on our websites. The Dana Point Historical Society’s (DPHS) 7th annual Founders Day event will be held May 28, 7pm, at the Dana Point Tennis Center , 24911 Calle De Tennis. Call (949) 248-8121 for details. The DPHS will also host a "Romantic Stroll Through Historic Homes & Gardens on the Bluff above Dana Point Harbor" on Oct. 5, 2008. I mention this in case you’re the type who likes to plan ahead. Huell Howser’s week-long tribute to Orange County began yesterday on KCET. Episodes will air at 7:30pm and 12:30am each day. To say that Chris Jepsen is Anaheim-based is like saying that the L.A. Times is Moscow-based, but on second thought, I think the L.A. Times actually IS Moscow-based. It's a good analogy, because I'm at least partly Anaheim-based in spirit - Even though I don't actually live or work in Anaheim. Does this new standard now make me Laguna Hills-based? Possibly. All I'm able to say for sure is that you would NOT be Fountain Valley-based,... even if you lived there. I actually saw Laguna Hills for the first time just days before we moved into the Fountain Valley house, that was in April of 1982.